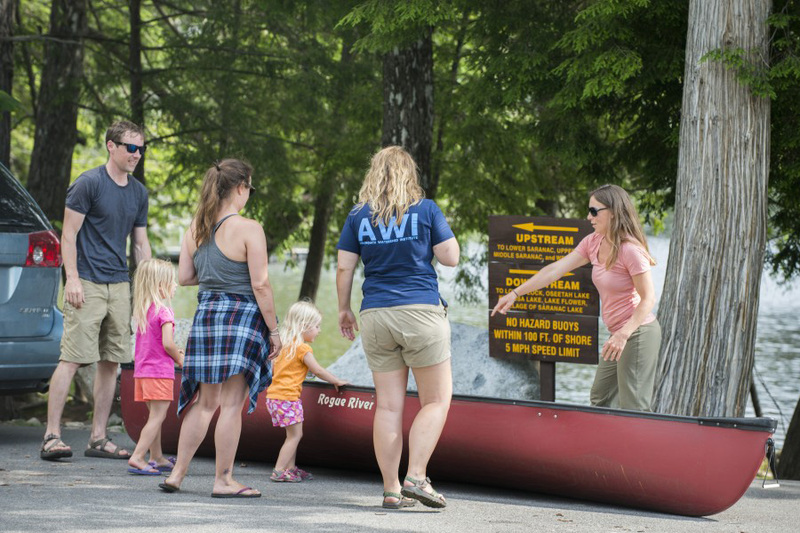 The Paul Smith’s College Adirondack Watershed Institute (AWI) is among a number of organizations and state agencies gearing up for boating season and aquatic invasive species spread prevention. While work protecting Adirondack waterways continues year-round, public-facing efforts are key as recreational watercraft susceptible to spreading invasive species move about the park in the coming months. The AWI’s Stewardship Program is the most visible, with employees working at public launch sites to inspect boats, as well as provide education and monitoring. Dozens of decontamination and wash stations are operated in and around the Adirondacks. Physical removal of invasive species, such as Eurasian watermilfoil, which grows in dense mats and outcompetes native aquatic species, also takes place. The spread of the plant also has substantial economic impacts on communities and businesses reliant on tourism and recreation. The New York State Department of Environmental Conservation (DEC) recently issued a release highlighting the myriad of efforts taking place this year, such as new highway-side stations, including one at a new Adirondack Welcome Center being built on Interstate 87 near Queensbury. The location will help provide early inspection/decontamination and education at a major entryway to the park. The DEC also credited the AWI as “taking a frontline defense against invasive species,” citing the five-year, $9 million management contract the AWI received through the state Environmental Protection Fund. The AWI also received a $594,276 grant from the U.S. Environmental Protection Agency on Oct. 11, 2018 for its ongoing work.